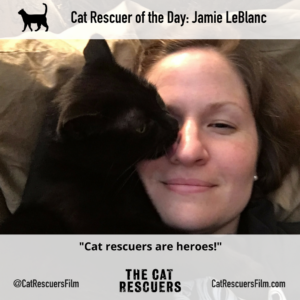 3/29 Cat Rescuer of the Day: Jamie LeBlanc! Meet Today’s Rescuer: Jamie LeBlanc from Baton Rouge, LA! I started in cat rescue while in college. I worked a student job at my University’s Vet school and it was then that the need for cat rescuers became shockingly clear. I’ve pulled numerous cats off of death row at my city’s pound, but one rescue in particular tops the list: I was helping a friend TNR a few cats in a run-down and dangerous apartment complex. We also rode around late at night to feed the starving cats in this complex. She was out feeding one day and one of the cats wasn’t coming to eat. After a few days passed, we were panicked. Someone in the complex quietly stepped forward and stated that he witnessed the beating of this cat and didn’t know if the cat died. At that point, we made it our mission to find hIm. We eventually did…and just in time. I scooped him up and rushed him to the ER. His abuser beat him to the point that his leg was broken and pulled out of socket. I raised enough money in two days to fund his emergency surgery. Once discharged, he came to my house to recover and I became his foster mom. He’s since been adopted into a perfect indoor hime and is thriving. He handled his tragedy better than I did and he is full of forgiveness and grace. That cats are often under-served. Most people believe that cats can “fend for themselves,” and therefore, dont make good pets. That cannot be further from the truth. I enjoy skydiving, volunteering at a local cat adoption center, spending time with the love of my life and reading. I cannot wait to see all of the cat rescuers doing their best for cats in need. Cat rescuers are heroes! Go follow Jamie on Instagram (@jamiecat84). And be sure to follow @CatRescuersFilm on Facebook, Twitter and Instagram!